Quintessenz FOCUS Zahnmedizin - ... Terry, Douglas A. 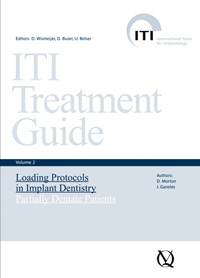 The second volume of the ITI Treatment Guide is devoted to the restoration of partially dentate patients. Central to this volume of the ITI Treatment Guide are loading protocols available to the clinician and the patient and how they relate to various treatment indications, including both single and multiple missing teeth in the posterior and anterior regions of the mouth. Among potential topics for upcoming volumes are implant placement in extraction sockets, loading protocols in edentulous patients, implant therapy in the esthetic zone in extended edentulous spaces, and many more. "Generally speaking, I enjoyed this relevant guide. Solid, evidence-based recommendations presented in a clear, concise and exceptionally organized manner make this a worthwhile text."